Back by popular demand: Another chance to see this lovely show. 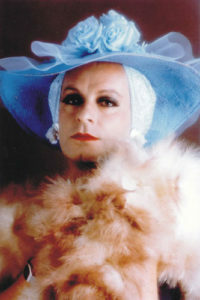 For South Africans of a certain vintage it feels like Tannie Evita Bezuidenhout has always been there. A total maverick and kind of mumsy, she always makes us laugh and helps to recalibrate our moral compass. 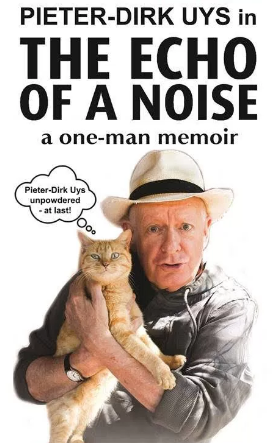 In The Echo of a Noise, playing at Theatre on the Bay in Camps Bay until June 18, her creator, Pieter-Dirk Uys, tells us his story behind her story. This is a memoir, full of history and raw honesty with many a whispered secret. Tannie Evita always made it look easy and so much fun to be a rebel, loud and proud with her wigs and her lipstick, poking fun at the absolute absurdity of apartheid. 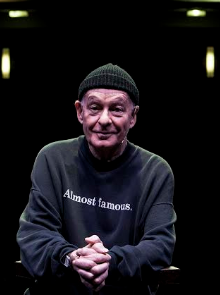 Here Uys shows us a different kind of courage as he sits alone on stage and tells us his story. That his father was an Afrikaner who played the organ in church on Sundays is no big surprise, that his mother was a German Jew who fled Nazi Berlin more so. Of course what this means, he says, is that he is a member of both chosen people. Uys, like Tannie Evita, never misses an opportunity to poke a finger in the eye of arrogance. Fans will love this intimate behind-the-scenes journey. Don’t expect too many riotous belly laughs, but you will likely want to lean in and listen to a story that will make you smile, giggle, murmur agreement and maybe even moisten your eyes a little. The Echo of Noise is at the Baxter Golden Arrow Studio Theatre from November 29 to December 17. Tickets via Computicket or 08619158000.